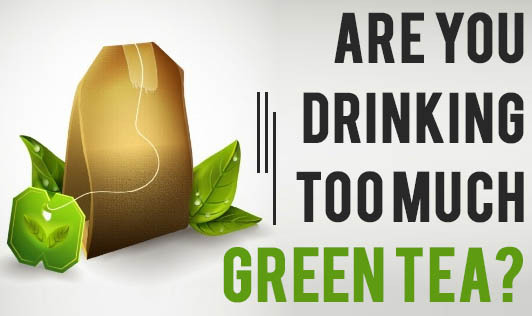 Are You Drinking Too Much Green Tea? For some of us, green tea has become a compulsory beverage through the day, while for others, it's a drink they struggle through just to reap it's benefits! While some of us find it hard to accept the distinct taste of this tea, some of us have "acquired" a taste for this drink! 1. Green tea in excess can cause anxiety problems in individuals. Headaches, nervousness, sleeplessness and irritability may be some associated symptoms. 2. Excess caffeine in green tea can lead to irregular heartbeats. 3. Green tea could interact with medications given to treat irregular heart rhythms, hypertension, anxiety problems and bipolar disorder, and cause an opposite effect. 4. Green tea contains vitamin K which helps in clotting of the blood. People under treatment for clots in the blood should preferably avoid green tea as it can worsen the problem. 5. Nausea, vomiting, headaches and a loss of appetite are other symptoms of excess green tea consumption due to caffeine toxicity. 6. Individuals with kidney and liver problems need to avoid drinking green tea. 7. Excess consumption of green tea can affect absorption of calcium and result in flushing out of calcium through the urine. This could result in osteoporosis. This may be a classic example of what anything in excess can do to you! Get the best from this tea by restricting your intake to not more than 2-3 cups a day, and you will be able to reap it's benefits well.